One of the most exciting promotions around, Sky Vegas Millions, is up and running right now over at Sky Vegas and with it comes the chance for you to win £25,000 in cash every week. The £25K Golden Jackpot ticket part of the promo allows players to rack up as many Golden Tickets as they can. The amount of tickets you earn is determined by how many times you’re entered into the prize draw for the incredible £25,000 jackpot. The Golden Jackpot will be taking place every Friday at 5pm at Sky Vegas. Every week that the offer is active, £25,000 in cold card cash will be waiting to be won. The great thing about this prize draw is that to enter, all you have to do is play your favourite casino games at Sky Vegas! As part of the Sky Millions giveaway, Sky Vegas is also holding a daily prize draw for all players. For every 500 daily prize draw tickets you earn, you’ll receive one Golden Ticket during the promotional period, which is active until April 28th. Different games at Sky Vegas will earn you a different amount of prize draw tickets, but it’s worth noting that the slots pay best. 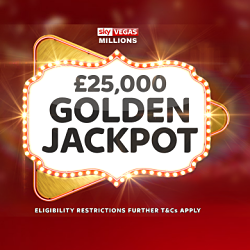 There’s no limit to how many Golden Tickets each player can accumulate, so keep on playing at Sky Vegas between now and April 28th for the best chances of winning one of the weekly £25K prizes. With £25,000 cash up for grabs each week, we can’t think of one good reason for casino lovers not to get involved with this prize giveaway. Even if you’re not a Sky Vegas member yet, you’ve still got plenty of time to sign up through Cashbacker and join in. The Golden Ticket prize draw is open to all registered members of Sky Vegas who play at the site with real money between February 27th and April 28th. The promotion is strictly limited to one entry per person. That means once per family, household, address, email address, IP address and banking details. A condition of winning the £25,000 jackpot is that the winner must pass a security check. The winning funds will be forfeited if the player does not pass this check.